Australia is leading the search for the plane which vanished on March 8 en route from Kuala Lumpur to Beijing with 239 people onboard and is using the Bluefin-21 mini-sub until new equipment can be obtained. “The autonomous underwater vehicle, Bluefin-21, was deployed from the vessel around 2:00 am this morning. It remains underwater on its search mission,” the Joint Agency Coordination Centre said. The US Navy Bluefin-21, which can plunge to a depth of some 4,500 metres (15,000 feet), was brought back to shore last week to fix technical issues which saw it pulled from the water. It resumed its search in the remote area of several transmissions believed to have come from the missing aircraft’s black box recorders. “Over the next week, Bluefin-21 will search the remaining areas in the vicinity of the acoustic signals detected in early April by the towed pinger locator… that are within its depth operating limits,” JACC said. The Australian ship which deployed the Bluefin-21, Ocean Shield, is expected to leave the search area on May 28 and return to Perth on May 31 to demobilise the mini-sub. MH370 is believed to have crashed into the southern Indian Ocean but despite a massive air and sea and underwater search, no sign of any wreckage has yet been found. While the aerial and sea surface searches have been scaled down, the operation is moving to the next phase which will involve using sophisticated equipment to scan the unmapped ocean bed. Negotiations are underway to engage contractors to do this work. 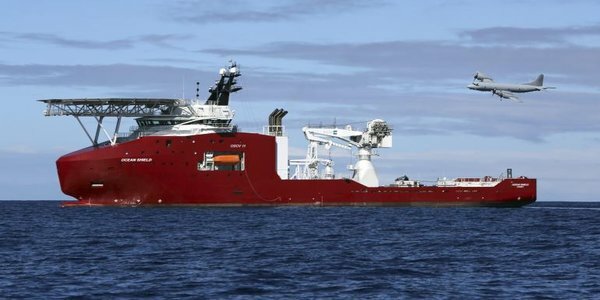 JACC said Chinese survey ship Zhu Kezhen left the west Australian port of Fremantle Wednesday to start mapping areas of the ocean floor in preparation for the commercially contracted deep ocean search. Another Chinese ship Haixun 01 was Thursday to depart for the area to support this operation, tasked with delivering survey data to Fremantle weekly for processing by Australian officials. JACC said work was continuing to review and analyse all the data and information relating to the likely flight path of MH370. “This work will confirm the best areas on which to focus an effective future search,” it said.